Methodologically, the project integrated spatial analysis and phenomenological fieldwork in order to investigate both quantitative and qualitative aspects of the location and setting of settlements, tombs, and ritual areas, focusing on understanding the relation between physical space and sense of place. 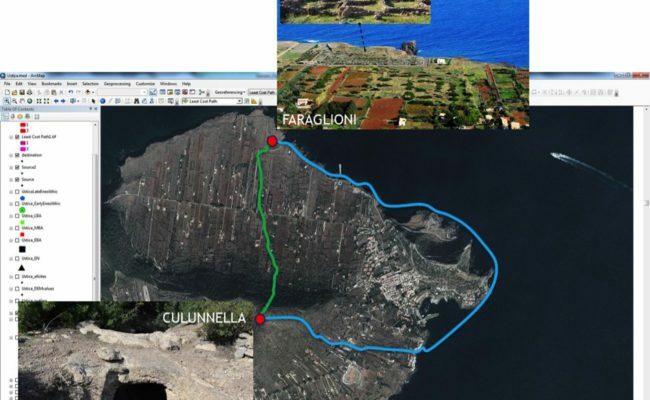 Archaeological data from twelve islands were provided by the relevant authorities in Sicily. During the Neolithic period, sites were mostly coastal but could also be inland, suggesting that access to farmland and to fresh water springs were prime concerns for early colonists (Fig. 1). 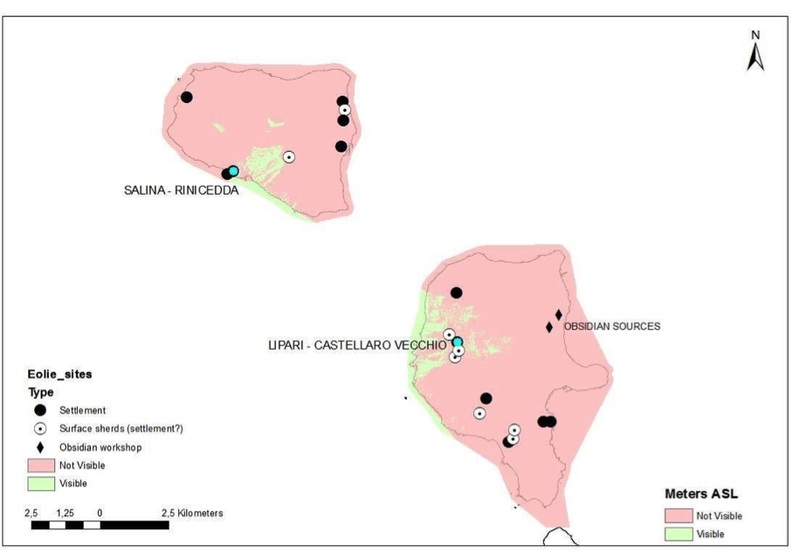 The location of early farming settlements in relation to the underlying geology was significant in a few cases: on Lipari, present-day agricultural activity still focuses in the same highlands where the island’s Neolithic colonists settled, selecting fertile and well-watered soils, made up of volcaniclastic rocks. Direct access to mineral resources, such as obsidian, which were extensively exploited, was apparently not so important. 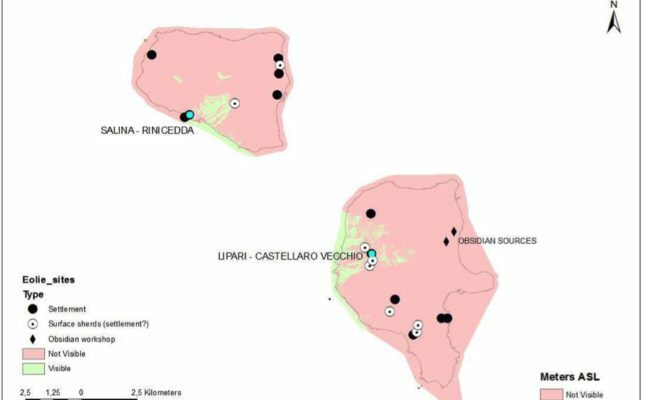 In the case of Lipari and Salina, islanders accessed the obsidian flows both by boat and overland. The obsidian sources were out of sight from the settlements (Fig. 2), yet presumably they were part of the islanders’ ‘mental map’. In the Bronze Age, there was a shift in the preferred settlement locations from inland and upland to coastal. Nonetheless, the coastal sites were either located on naturally defended headlands or were fortified (Fig. 3). 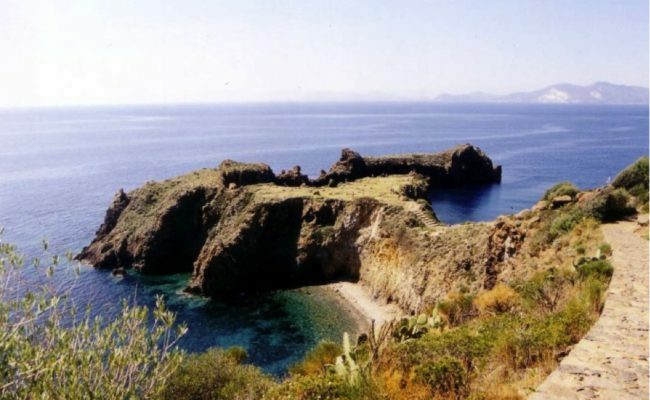 On the larger islands, such as Lipari, small scattered farmsteads took advantage of the best landscapes: small floodplains, rocky outcrops rising above the sea with small plateaux at the summit, and the interior upland plateaux. This pattern indicates that while the islanders were increasingly tied to maritime trading networks, agriculture remained an important activity. Burial areas were closely associated to settlements throughout the period under study, and in the Bronze Age they were located on steep-sloping ground with commanding views above the settlements and surroundings. 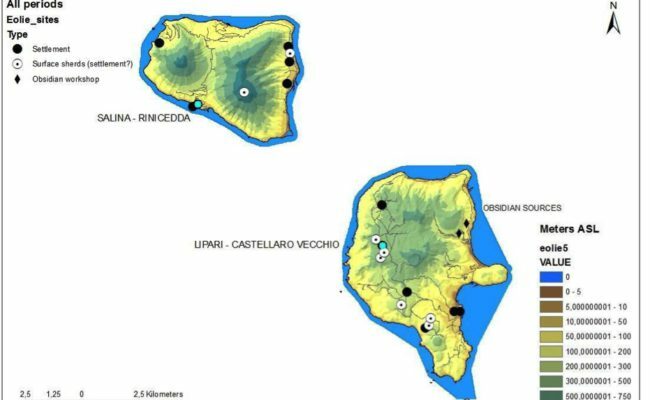 The study also considered how the natural environment contributed to the creation of symbolic and cultural aspects of the island’s topography. Ritual activities focused on striking places such as cave sites with stillicide water, thermal springs, and fumaroles. Remarkably these sites were used for considerably longer periods compared to settlements and burial areas, indicating strong place attachment. Phenomenological fieldwork on the island of Ustica noted the prominence of such landscape features, in terms of their visibility, sounds and smells. Walking along the “least cost paths” between different sites highlighted changes in the landscape, an experience that could lead to the creation of mental maps (Fig. 4). 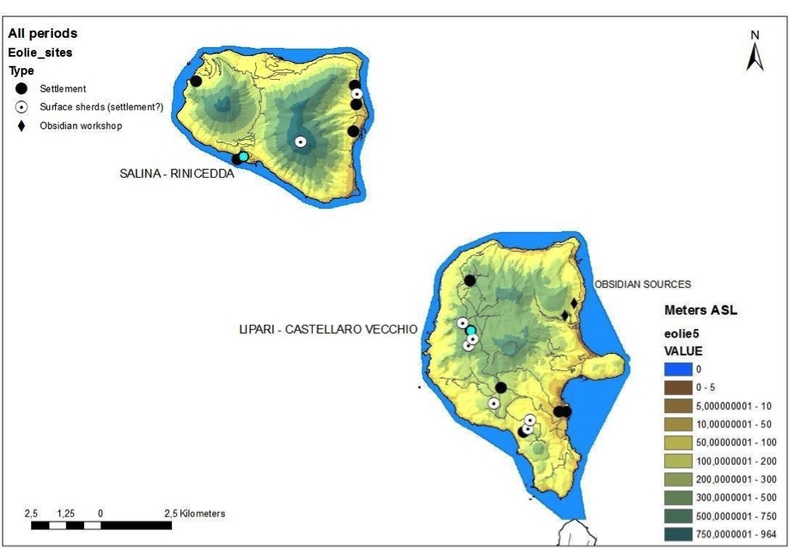 Overall, the spatial analysis and landscape observations indicate some common features in the twelve islands under study, suggesting that an island space had a considerable bearing on the formation of community identity also in the prehistoric period. Site locations and landscape settings reflect the islanders’ place attachment and space-related identities, in relation both to the sea and the land. Place-making is an important aspect in the process of colonisation of small islands and helps explain episodes of occupation and abandonment, periods of increased cultural connectivity and isolation. 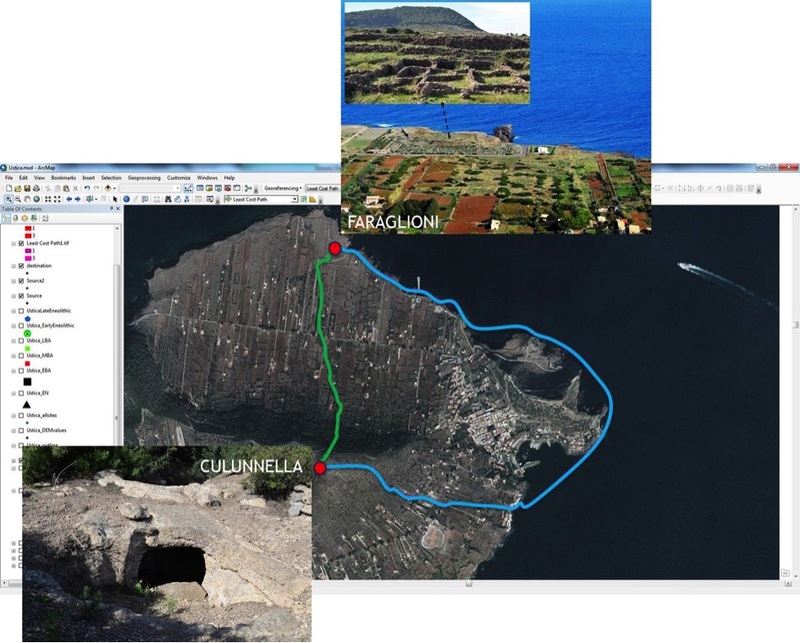 The project has shed light on such processes and provided important elements for Helen Dawson’s current work on Mediterranean island networks, population mobility, and cultural interaction during the Bronze Age. 2017 Helen Dawson and Irene Nikolakopoulou, “East meets west: Exchange and Identities in the Bronze Age Mediterranean”, in: D. Warburton (ed.) Interaction on the Edges of the Ancient Empires: Economics and Identities. Proceedings of the international workshop, Topoi, Berlin, 25-28 June, 2014, Berlin: Edition Topoi. 2016 Helen Dawson, “Brave New Worlds: Islands, place-making, and connectivity in the Bronze Age Mediterranean”, in: B. Molloy (ed.) Of Odysseys and Oddities. Scales and modes of interaction between prehistoric Aegean societies and their neighbours, Sheffield: Sheffield Studies in Aegean Archaeology, 2016, 323-342. 2015 Helen Dawson, “Deciphering the elements: cultural meanings of water in an island setting”, in: Accordia Research Papers 14 (2014/2015), 13-26.